There are a lot of opportunity in forex trading. You can make additional income or increase your wealth. But the question is, how to start forex trading. In this article, we're going to look at the things you need to do if you want to start forex trading. If you want to be a successful forex trader, these are first steps you have to do. If you are a beginner in forex trading, first you need to understand basics of forex. 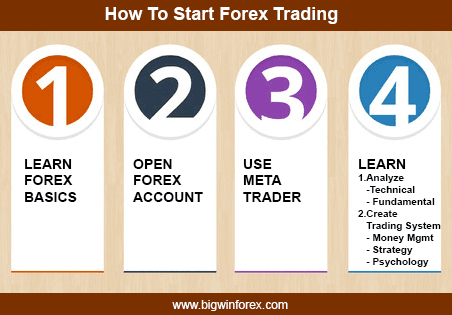 You need to open forex account in forex broker to be able to trade forex. Unfortunately, there are hundreds forex brokers out there. You must pick the best forex broker that suits your trading needs. If you have never traded before, start a forex demo account. It takes just five minutes of your time to open a demo account, costs you nothing and allows you to safely experience the forex market. Practice on a demo account with virtual money to understand how to use the trading platform software. If you are ready, go open a real forex account. To learn about actual trading and to get a real feel for being in the market you need to trade on a live account. Deposit real money and start making profits in forex trading. You need to download trading platform software to be able to trade forex. Most popular software used in forex trading is MetaTrader. It's free to download and use. First you need to learn to analyze the market. Usually trader uses Technical Analysis or Fundamental Analysis to read the market. Technical Analysis involves reviewing charts or historical data to predict the direction of the currency. Fundamental analysis involves looking at a country's economic fundamentals and using this information to influence your trading decisions.